This Spring’s featured ingredient is Chocolate. Chocolate is made from the seeds of the theobroma cacao tree. “Theobroma” means the “food of the gods” in Greek. Cacao seeds, also called beans, grow inside fruit pods, which grow along the trunks of the trees. The word “cacao” was derived from the indigenous Mesoamerican name for the plant. There are competing explanations for how the word “chocolate” was coined by the Spanish conquistadors. It has been proposed that that the most likely explanation is a union of the Mayan word “chocol,” meaning hot, and the Aztec word “atl,” meaning water. DNA sequences and climate models suggest theobroma cacao originated in the rain forests of northern South America. Theobroma cacao was likely first domesticated in the tropics of Peru for the sweet pulp surrounding the beans, which was enjoyed as a snack and fermented beverage. The cacao beans were likely discarded. From South America, scientists believe domesticated cacao was brought north to Mexico, where it began to be selected for its beans. Evidence of the earliest consumption of cacao beans is currently from Chiapas, Mexico from a Mokaya archeological site. A ceremic vessel was found containing the residue of pulp and beans dated back to 1900 BC. Chocolate consumption began as a frothy beverage. The beans were ground, mixed with water, and poured back and forth between vessels until a thick foam developed. Unlike today’s hot cocoa, which has had the cocoa butter removed, early chocolate beverages contained the entire bean. This made the beverage much more rich, thick, and frothy. Chocolate was first enjoyed by royalty, priests and great warriors. It was drunk during ritual ceremonies, and as medicine. Mayans are said to have drunk their chocolate warm, while the Aztecs enjoyed it cold. Chocolate flavorings included chilies, corn, vanilla, allspice, flower petals and honey. As chocolate became more widely grown and transported, it began to be used as money. Cacao beans were used to pay annual taxes to emperors, and to purchase goods, like fabric. Christopher Columbus was the first recorded European to encounter cacao beans visiting the Americas, when his men captured a canoe full of the beans. Noting the high regard the Mayan traders held for them, Columbus took them back to Spain, but the “bitter almonds” were overlooked by the Spanish court in favor of other treasures. When Spanish King Charles’ court adopted the drink and it began being given as a royal dowry, chocolate became fashionable among European aristocrats. Importation of cacao from the Americas to Spain followed. Later cacao plantations were established. Soon chocolate houses were opening throughout England. Europeans replaced honey and chilies with sugar, vanilla, anise, cinnamon, nutmeg, annatto, and orange peel. Our Founding Fathers were very fond of drinking chocolate. Thomas Jefferson believed its popularity would surpass coffee and tea. George Washington ordered chocolate be served to guests each breakfast at Mount Vernon. Benjamin Franklin sold chocolate in his printing shop, and personally bought chocolate to fortify the troops of the French Indian War. Cacao was first ground by hand to make chocolate. Then wind-power and horse-drawn mills were utilized to speed production. These processing methods were costly, making chocolate too expensive a treat for the common man. Then the Industrial Revolution arrived, bringing steam-powered engines to chocolate mills to speed the processing of the bean, and chocolate became more affordable. Chocolate being sold to the populace at this point were hard “cakes,” made of roasted cacao beans ground into paste, thickened with various fillers. These cakes were then grated and mixed well with boiling water, sugar, and often milk and spices, in an attempt to emulsify the cocoa butter into the gritty, rich beverage. By the 1800s, innovations in chocolate abounded. Inventors sought to make chocolate easier to dissolve, filler-free, smoother, and less acidic and bitter. In the early 1800s, innovations by Dutch chemist Coenraad Van Houten helped usher the world into the modern era of solid chocolate. Van Houten first added alkaline (basic) salts to neutralize chocolate’s natural acidity, smooth its flavor, enhance its dark color, and improve its solubility with water. This “dutching” process made chocolate palatable to more people. Today though, dutching is falling out of vogue due to it substantially reducing the acidic bio-active nutrients called flavonoids to which many of chocolates medicinal properties are attributed. Soon after, Van Houten invented a press which produced cocoa, removing about half the cocoa butter from chocolate liquor. This drastically reduced the amount of time required to make a cup of hot chocolate, or more accurately hot cocoa. The invention of the world’s first eating chocolate in England came swiftly on the heels of dutched cocoa’s invention. 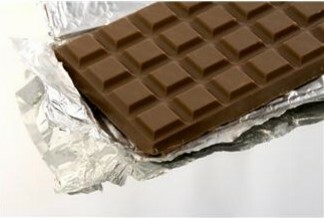 Cocoa butter and sugar were added to cocoa to form chocolate bars. Milk chocolate was born with the addition of powdered milk. Producers began molding the chocolate into shapes. The newly invented eating chocolate was exhibited at the international Great Exhibition in London in 1851, a celebration of modern industrial technology and design. Also part of the exhibit were cacao tree trunks with pods, and steam powered chocolate making machines. Queen Victoria, who visited the Exhibition three times with her family, was reportedly greatly impressed by the chocolate exhibit. And then during the late 1800s, Swiss inventor Rodolphe Lindt invented “melting chocolate.” Legend has it that Lindt forgot to turn off a chocolate mixer one night. The next morning he was initially distraught, but upon tasting the chocolate discovered he had made a momentous break through. The sustained friction of the mixer had smoothed the chocolate’s normally gritty texture to silk, and given it a milder, caramelized flavor. The melting point had been lowered, allowing for the first time for chocolate to melt in one’s mouth. Experimenting further, Lindt developed a conching machine comprised of a granite roller and trough resembling a conch shell to produce his melting chocolate. The chocolate was such a success, Lindt could not keep up with public demand and shared his conching secrets with another producer. Theobroma cacao trees generally grow within a band around the equator, with 20 degrees latitude. When the football-shaped cacao pods are ripe, they are harvested by being gently knocked off the trunk. Then the pods are split open with a machete, or a rock. Ripe pods are usually a yellow orange color, but there are also green, purple, white, and red varieties. The sweet white pulpy beans are pulled out of the pods, placed in piles, covered in banana leaves, and allowed to ferment and dry until dark brown, to develop their “chocolatey” flavor. Dried beans can be roasted, or left raw. The term “cacao” has come to be used for raw products, though it is traditionally used to refer to the plant. “Cocoa” is the powder made from roasted, ground beans that have had their cocoa butter removed. Next, delicious chocolate is made! 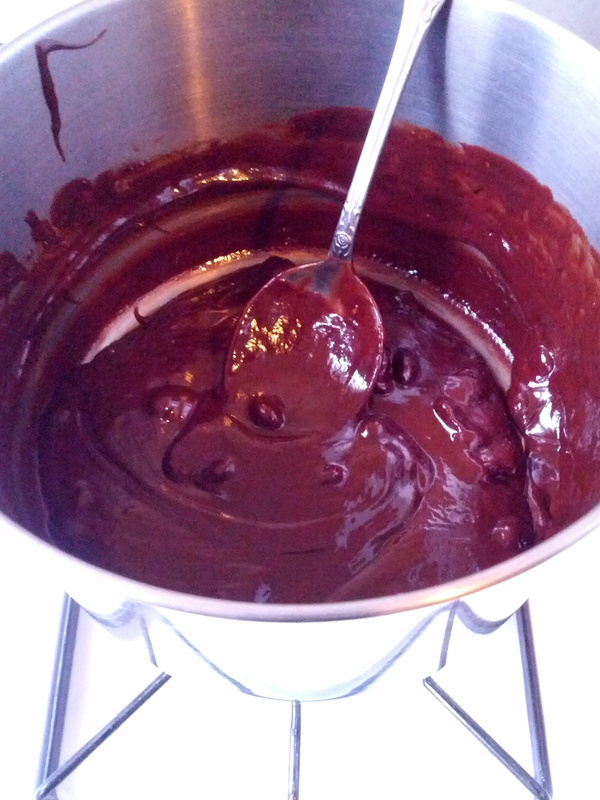 Cacao nibs are ground into liquid chocolate (a.k.a. liquor). Some manufacturers then press the liquor until the cocoa and cocoa butter separate, and then mix them back together in different percentages to achieve a desired texture. Flavoring is added with ingredients like sugar, vanilla, salt and milk powder. Additional cocoa butter may be added for texture. The chocolate can then be conched (a.k.a. mixed) to smooth texture and flavor. The elevated temperature caramelizes sugars in the chocolate. A consideration is that air moving through the conche progressively oxidizes and removes its strongly-flavored bioactive nutrients. Thus, the longer the liquor is conched, the less nutrients it retains. Many chocolateers seek a conching time that balances optimal flavor with retained nutrients. For small batch chocolateers, melangers are often used to process the cacao. A melanger is a stone grinder that can carry out all the steps of grinding, mixing and conching required to make chocolate. It is generally the size of a large food processor. Many families are now using them to make chocolate together at home. In tempering, first the chocolate is heated to melt all six forms of crystals. Next, it is cooled to the temperature crystal types four and five form, while being agitated. Traditionally, this is accomplished by spreading it skillfully on a marble counter. Then the chocolate is heated again to just below the temperature type five beta crystals melt, to melt the unstable crystals while preserving the beta crystals. Today, many chefs are foregoing the marble counter top for the microwave method of tempering. First, 75% of the chocolate is microwaved at 50% power until mostly, but not fully melted. The remaining 25% solid chocolate is stirred into the melted chocolate as a “seed” for type five beta crystals formation. Then the chocolate is returned to the microwave for a few seconds at a time, stirring frequently, until the chocolate is completely melted. Care is taken not to overheat and burn the chocolate. 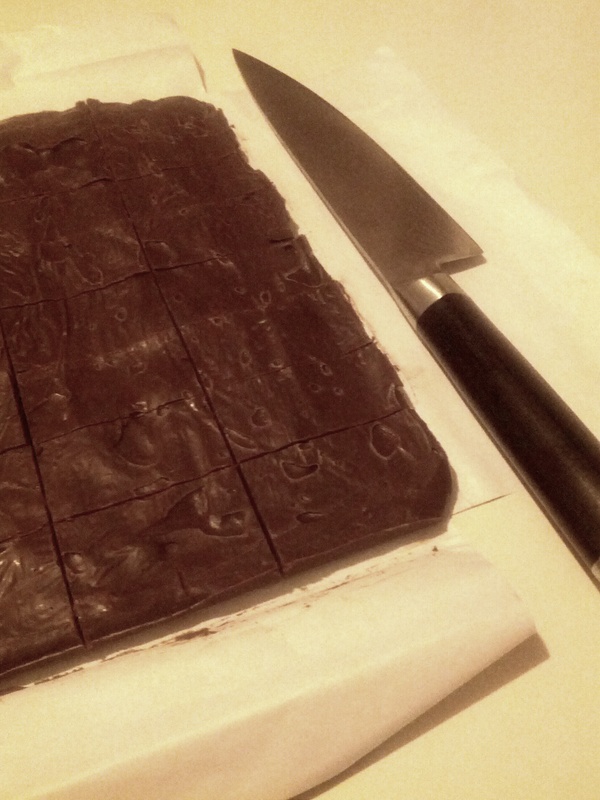 Finally the chocolate is molded into shapes, and wrapped. This Spring’s Recipe is for Chocolate Truffles. 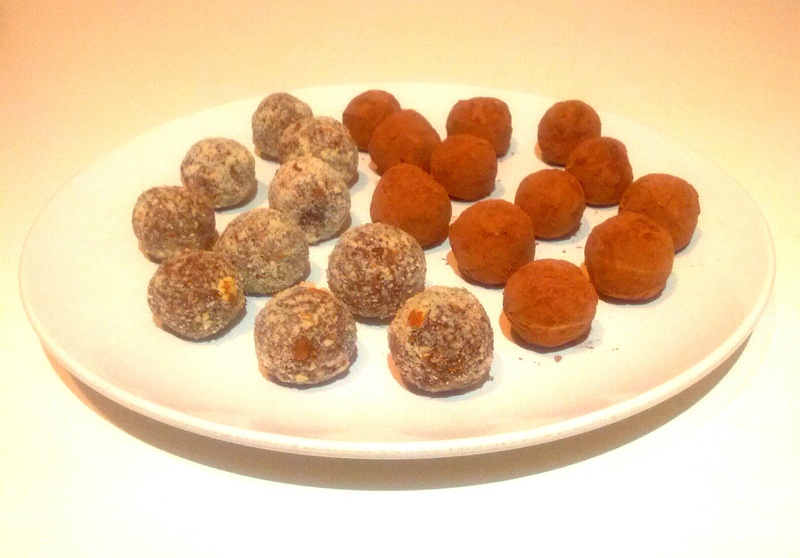 Truffles are made when melted chocolate is mixed with cream, rolled into balls, and dusted with a topping, like cocoa. The texture of truffles is softer than a chocolate bar, melting almost instantaneously on the tongue, but with a similar flavor intensity. Our recipe adds butter and fructose syrup for a smooth texture. Coffee crystals, vanilla extract and salt enhance flavor. 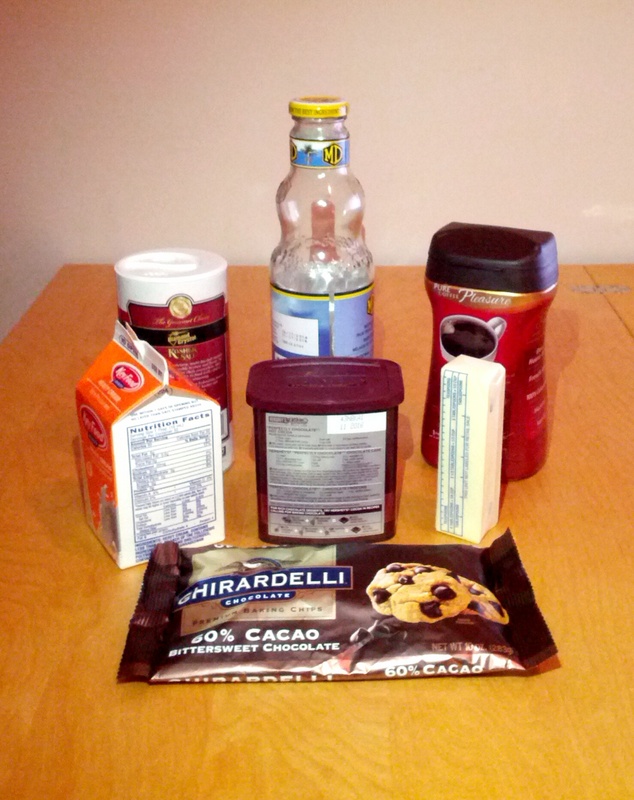 All of these additions however are not necessary to make chocolate truffles. In a pinch, all one really requires is chocolate, cream, and cocoa. 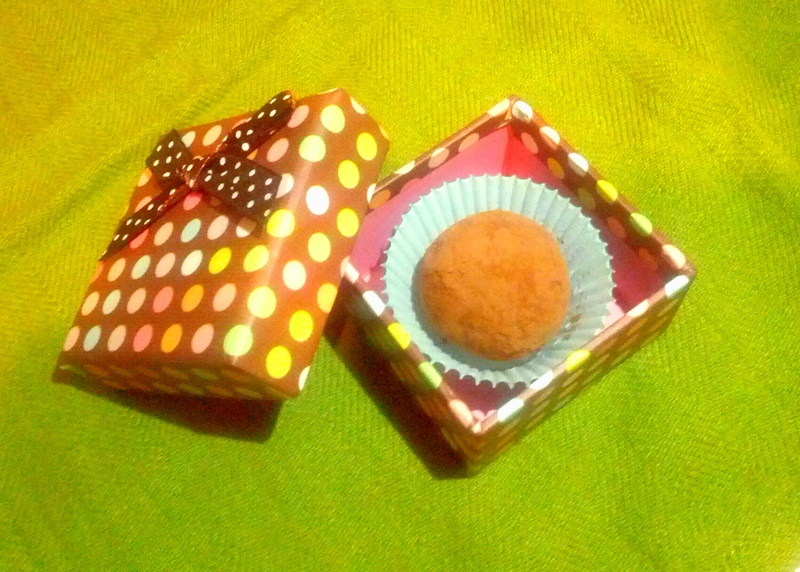 Chocolate truffles make delicious gifts. Pack them in food gift boxes in mini muffin cups, available at container specialty stores. Chocolate truffles can also be used to make hot chocolate and mochas. 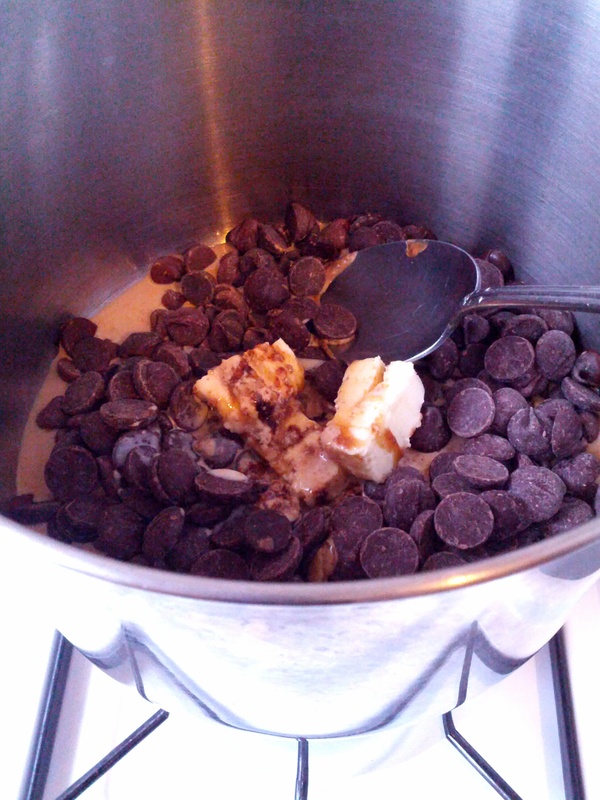 Stir one to four truffles into a splash of heated milk or coffee to dissolve. Then fill cup with heated milk and/or coffee. Substitutions: For vegan truffles, use quality dairy-free dark chocolate chips, and substitute a non-dairy high-fat creamer for cream. The coconut cream from the top of a refrigerated full-fat can of coconut milk is also a great cream substitute. No cream? Warm 3 parts milk with 1 part melted butter as a cream substitute. Alternative Microwave Method: Microwave ingredients on 50% power in plastic bowl, stirring occasionally until mostly melted, ~2 minutes. Pour into parchment paper lined pan. Continue below with instruction number four. 1. 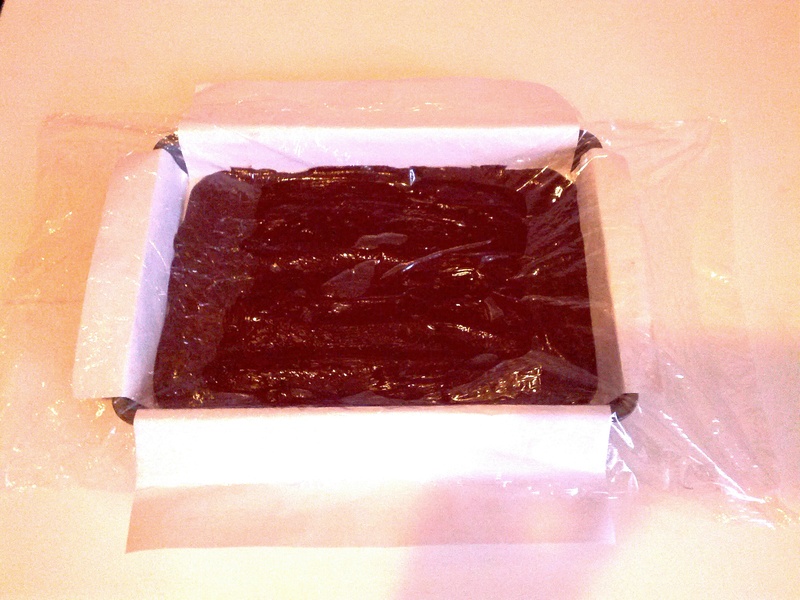 Line 8 x 8″ pan with parchment paper, with ends of paper draped over pan edges for ease in removal. 2. Create stove top double boiler by filling pot with a couple inches of water, bringing to boil, turning off heat, and placing metal bowl (or nesting pot as shown below) on top of pot with hot water. 3. 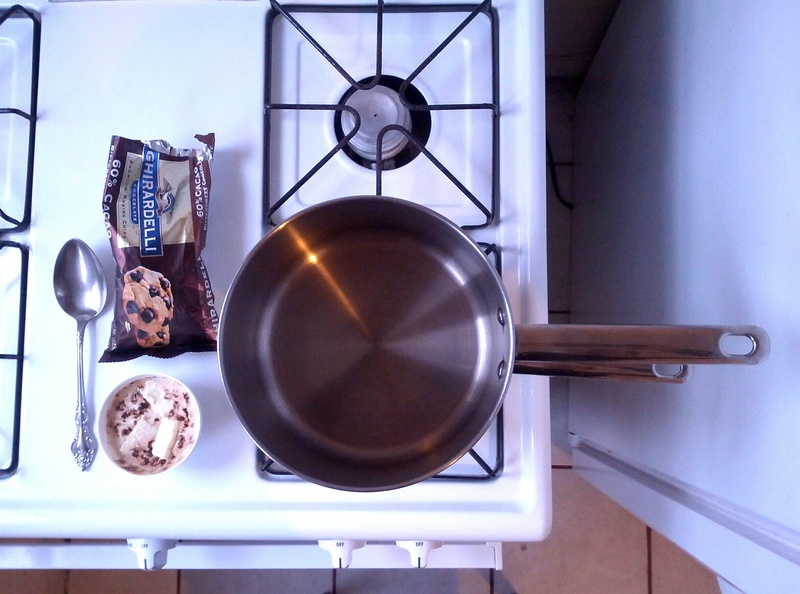 Heat the chocolate chips, cream, butter, syrup, instant coffee, vanilla, and salt in metal bowl over simmering water just until warm and almost smooth, stirring occasionally until ingredients are incorporated. Remove from heat. 4. 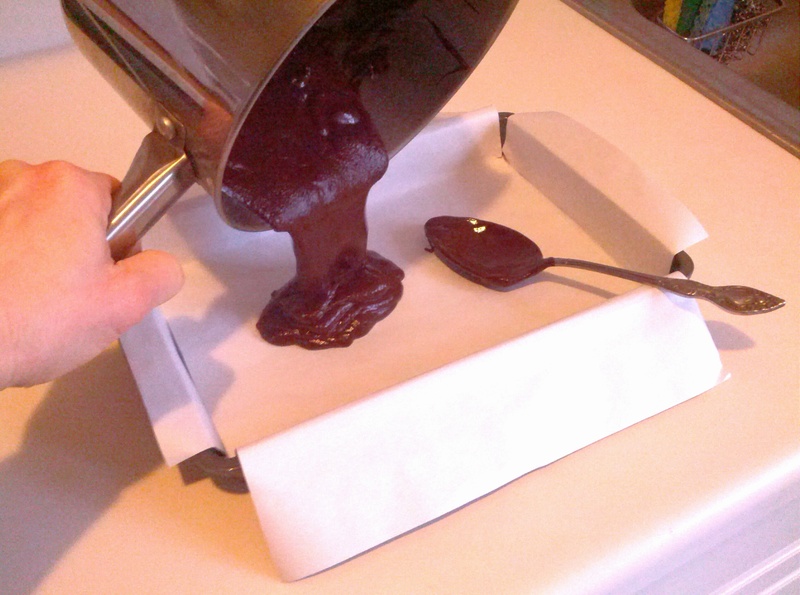 Pour chocolate into 8 x 8″ pan. Cover pan with wrap. Set aside for 2 hours at room temperature. 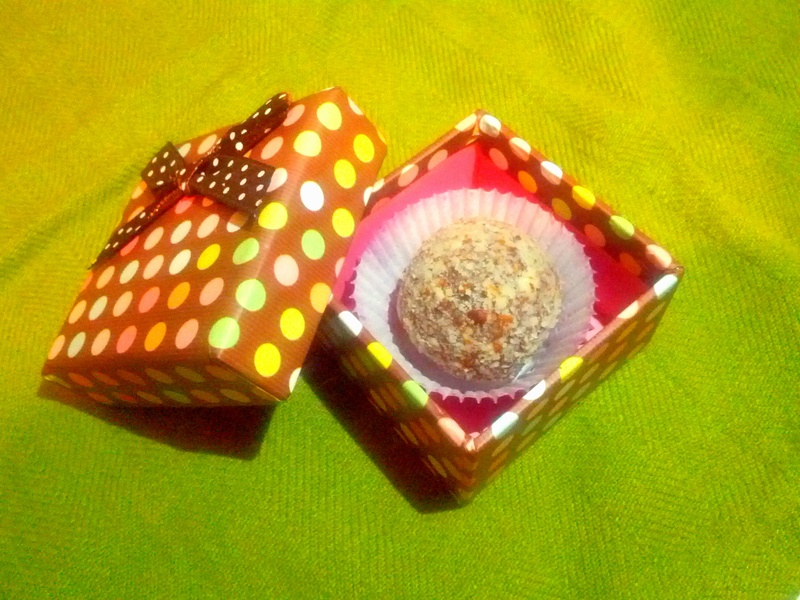 If chocolate is not firm enough to roll into balls without sticking to hands, refrigerate 1-2 hours. 5. Slice into ~24 squares or bite sized pieces. 6. 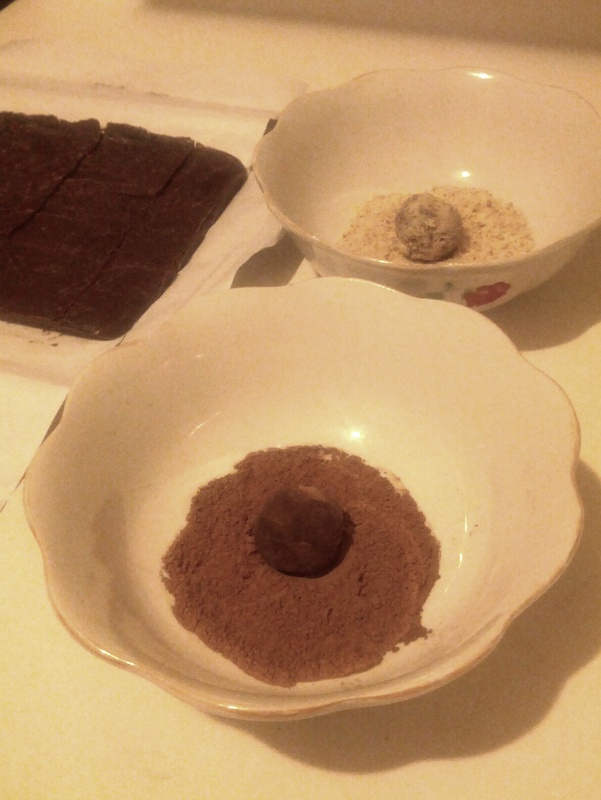 Dust hands with cocoa or powdered sugar, and roll each square into a ball, incorporating filling if desired. Roll balls in selected topping(s) in bowl(s). 7. Transfer truffles to airtight container. If too soft, refrigerate 1-2 hours to set. Store refrigerated in airtight container for up to one month, or at room temperature up to 2 weeks. Allow to warm 10 minutes at room temperature before serving. 1. Terry G. Powis, W. Jeffrey Hurst, María del Carmen Rodríguez, Ponciano Ortíz C., Michael Blake, David Cheetham, Michael D. Coe & John G. Hodgson (December 2007). “Oldest chocolate in the New World”. Antiquity. 2. Sophie D. Coe. America’s First Cuisines. University of Texas Press, 1994. 4. Rodney Snyder. “History of Chocolate: Chocolate in the American Colonies.” Colonial Williamsberg Teacher Gazette. 8. Hooper L, Kay C, Abdelhamid A, Kroon PA, Cohn JS, Rimm EB, Cassidy A (2012). “Effects of chocolate, cocoa, and flavan-3-ols on cardiovascular health: a systematic review and meta-analysis of randomized trials.” Am J Clin Nutr 95 (3): 740–51.